I am shocked, SHOCKED, that you have not reviewed this before now. It was one of the first Bollywood movies I ever saw and cemented my love for all kinds of things. It is one of the go-to movies I recommend to new viewers! 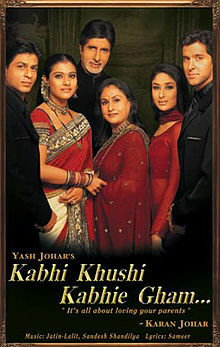 This was one of the first Bollywood movies, I saw, too, Julia! Since I watched it back before I started writing about Hindi films, reviewing it wasn’t a big priority. Now that it’s back on Netflix, hopefully a new generation of Bollywood fans will get to experience the wonder that is K3G. I really liked this movie for the acting, the music, and the dancing, but some of it is so over the top it’s hard to watch. I had a completely different reaction to Pooja–I couldn’t stand her most of the time. I don’t think we can call out Rahul’s mesh shirts unless we also mention Rohan’s awful disco attire. I have other problems with the plot besides the ones you mention. I find it hard to believe Rahul doesn’t recognize his brother after 10 years despite the makeover. I wish Yash had gotten his come-uppance for totally disregarding the pain he was causing his family in keeping Rahul away. But I loved Rahul and Angeli, both courting and married. Farida Jalal is one of my favorite actresses. And the references to Kuch Kuch Hota Hai are cute. It was definitely worth watching. I dislike this movie, I have never been able to finish the film. It is so melodramatic, over the top and full of weeping. The worst part for me though was the unbearably poor acting from Kareena(probably the worst I have ever seen) and shrieking from Kajol. The songs are the saving grace. So glad you reviewed this, and even happier that you liked it. Through the years this has emerged through thick and thin as my favorite Bollywood movie. Not necessarily the best, but in terms of pure entertainment value, it’s second to none in my honest opinion (and that’s saying a lot, since it has Hrithik before he learned how to act). I’ve just rewatched this movie (again) while on a Hindi film kick this weekend, and I have a question. Are we supposed to think that Rahul told Anjali about his father’s approval before he married her? Or after? The timeline between the funeral and wedding is clearly tight (I don’t think it’s the same day, but obviously it’s soon afterwards) and I wonder when that conversation would have taken place? I know Karan Johar talks on the DVD or somewhere about different ideas for filming the wedding scene, but does he ever mention this? Not that this story grants its female characters a lot of agency; when their love interest turns up, these women tend to melt. And Anjali is desolate. So it probably doesn’t matter, she would still have married Rahul. But in the next scene where we see the hissy fit, I mean stern denunciation that Yash throws down, I can’t quite tell if Anjali is supposed to be surprised. Despite flaws (which you have clearly laid out, Kathy — and the “fatty” comments are even more grating upon rewatching) I do love this film. I agree too with other posters that Poo is not my favorite character, and I have to look away from most of Rohan’s party gear. Still, it is grand in its scope somehow, which is its great charm. Hi, Toni! It’s been long enough since I watched this that I can’t comment on the scene you mentioned specifically. Maybe someone else has some thoughts. All the characters seem to be operate under the “love is not a choice” umbrella, which sort of renders agency moot. From what I recall, even poor old Naina immediately commits to remaining single forever since she will never, ever be able to love anyone besides Rahul.